Both these methods transfer the rotation of the steering wheel into linear movement of the track rods, which then turns the wheels right or left. At high speeds, it is essential there is fine control of the turning of the wheels, and the Pitman Arm/Bell Crank plays a crucial role in ensuring that when the driver turns the steering wheel even slightly that this movement is transferred into steering of the wheels. Any play or movement is not acceptable, especially at speeds above 30 mph. 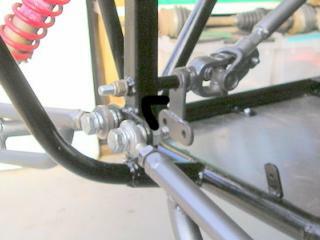 The Pitman Arm method used on the kartbuilding.net steering plans #2, #3, where a simple drop arm welded to the steering column connects to the track rods via a 10mm HTS (High Tensile Steel) bolt, moving them from right to left. As can be seen in the photo on the left, the Pitman arm is attached to the steering column, and the other end of the arm is connected to the track rods. To compensate for the angles and movement in angles, rose-end bearings are used at the ends and middle of the track rods. This allows for ease of movement. The length of the Pitman/Drop Arm can be adjusted to make the steering easier, or more abrupt and sudden. The bell crank method is found to be a more efficient and precise method of steering, however this method can be a bit more difficult to setup on a go-kart. Typically bell cranks are L shaped levers, which can move track rods from side to side. As the bell crank is essentially a lever, there is more room for tweaking the gearing/leverage required, allowing steering to be made easier or more abrupt. The connection in the photo on the right however, does not connect up with the steering column. In order to adapt the bell crank to work on a kart, or off-road kart, the setup as outlined on the image below is required (thanks to theo). In this case a universal joint was used to transmit the rotation of the steering column to the bell crank, which in this case is T shaped. As a result the bell crank provides for more positive steering than the pitman arm. Just to point out, steering racks, in a car for example, do not operate on either of the above principles/ methods, as gears are used to transfer the rotation of the steering wheel to linear movement of the track rods. 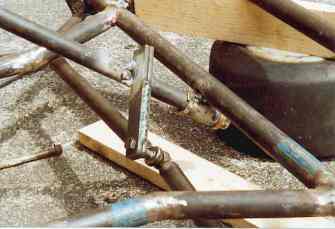 The steering racks in a car can weigh quite heavy, and can add unnecessary weight to a kart, even when adapted to suit a kart. For the purposes of karting and general karts, the pitman offers a quick, easy and effective solution. Its more of a realisation of the bell crank, that I wrote this article, and to mention its existence. Whatever method of steering is chosen, it needs to be firm, positive and strong enough to withstand heavy driving. If you have any comments about this article, feel free to email me at kartbuilding [at] gmail.com and I will post them here.